Unfortunately, there have been a lot of stories in the news lately about limousine safety. We recognize that this is a major concern for all our customers and frankly, it is why we make it a top priority. At Le Limo we do things a little bit differently than some of our competitors. We typically don’t boast about our safety record and procedures, we think it should be part of the expectation of hiring a limo company. But since it’s been in the news we wanted to share some of the aspects of our safety procedures. Every Le Limo party bus, every limo, every trolley and every coach is equipped with a fire extinguisher. All of our buses have been designed with an emergency exit. We go through a stringent review process with the Department of Transportation. It is part of our corporate philosophy to exceed their minimum safety requirements. We don’t cut corners on safety…not even a little bit. Our drivers visually inspect the fleet prior to every run to ensure that everything is in operating as designed. Le Limo is one of the only limousines in the state that has its own in-house repair shop. We have certified mechanics making repairs as needed based on a feedback from our drivers. Drivers are prohibited from drinking alcohol prior or during their assigned run. Le Limo performs random and unannounced drug tests on drivers sporadically throughout the calendar year to ensure that they are not under the influence of any narcotics. Each month every car goes through a thorough safety inspection and routine maintenance is performed per the manufacturer’s guidelines. Tires are routinely inspected for tread wear and changed regularly with our equipment in-house. We just don’t think safety should be your concern when you hire a limousine. We think it should be our concern. 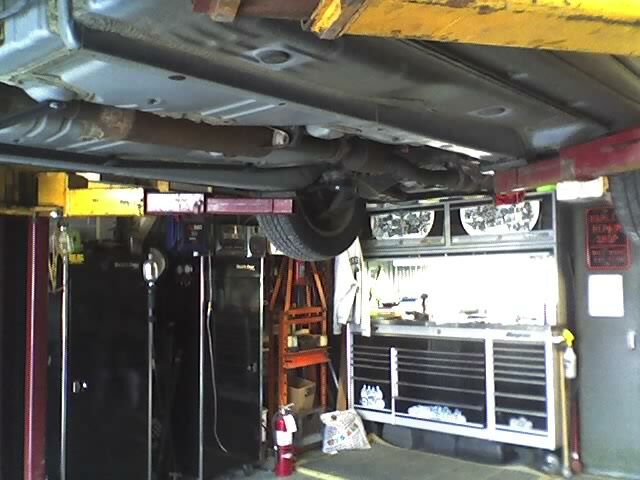 This car is getting new transmission fluid in one of our garage bays.